Car: 4895 By: DiRF Comment: "I still think these are very handsome, and they've..."
Car: Fpost By: DiRF Comment: "A Craigslist ad that is well written and separated..."
Car: Fpost By: Low-Tech Redneck Comment: "Feelin' cute, might turn up on Craigslist later, I..."
Car: Fpost By: Skid Comment: "Not a convincing replica, but cute...."
Car: Fpost By: wannabemustangjockey Comment: "https://sfbay.craigslist.org/nby/ctd/d/sonoma-1930..."
Click here to let us know if the image above is broken. Go back and vote on this image. whats wrong with this pic? Left exhaust tip is smaller? 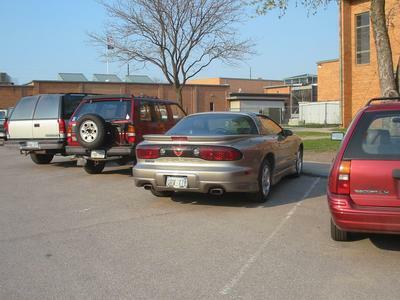 I think this was my lame attempt at saying "omg omg a Firebird in the HS parking lot." Sadly enough, that was the norm. Oh well. Want to send some feedback? Click here. All pictures on this site are property of their respective owners. Copyright © 2000 - 2019 Ricecop. All rights reserved.